The Samsung Galaxy S5 comes with a 5.1" 1920 x 1080 display of the Super AMOLED variety with a pixel density of around 432ppi. The LG G2 has a 5.2" True HD-IPS+ LCD panel of the same 1920 x 1080 resolution, which breaks down to around 424ppi. The numbers are pretty close, and each technology has its advantages - and downsides. Before we get deep into the details, the difference in size is probably of little relevance here. 0.1" inch is insignificant and the on-screen buttons mean a portion of the LG G2's screen is unused, except in the video player, where all the screen estate is available. Double-tap-to-wake is a nice little trick we like in the LG G2 though. And those slim bezels of course. The cross-hatch pattern that gave AMOLED screens a bad name is no longer an issue at these resolution levels but the perceived sharpness is inevitably affected - again not something that's visible to the naked eye. 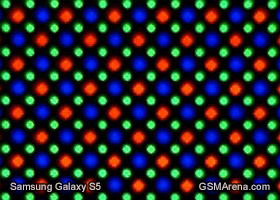 The Super AMOLED screen on the Galaxy S5 is the PenTile variety, with subpixels arranged in a diamond pattern. 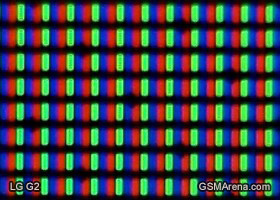 What this means is each individual pixel isn't made of a standard red, green and blue pixel like in LCD screens. The differences are mostly visible under the microscope. 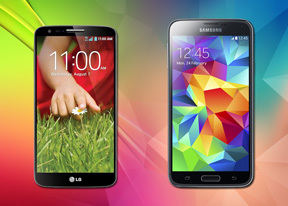 The LG G2's standard RGB matrix has an equal amount of equally-sized red, green and blue pixels. A redesigned panel gives the Galaxy S5 a number of important improvements over last year's model: higher brightness and more efficient backlighting, as well as lower reflectivity. The Super AMOLED already offers much punchier colors, the deepest blacks and practically infinite contrast but for those who prefer true colors can have it their way too. Several screen modes allow users to calibrate the screen saturation to their liking, with Cinema mode as close to standard RGB as a smartphone can get. Here go the numbers. The blacks of the Galaxy S5 are unmatchable by an LCD although the LG G2's blacks look pretty impressive at up to 50% brightness. The LCD panel on the LG G2 is inherently the brighter of the two. Contrast-wise, the AMOLED wins although the LG flagship posts some impressive numbers. When things get cranked up to 100% brightness the G2 struggles with the blacks and loses some of its contrast ratio. In the opposite corner, the Galaxy S5 fails to match the LCD maximum brightness but is probably the brightest Super AMOLED to date - without compromising the blacks and, therefore, contrast ratio. As for outdoor visibility, Super AMOLEDs are clearly superior in bright sunlight as they offer one glass layer less. The Galaxy S5 gets a score that's up there with the best we've tested. On the other hand, the LG G2 has a more reflective screen that loses contrast in the sun. Winner: Samsung Galaxy S5. The Galaxy S5 has the smaller screen but makes up for it handsomely in terms of performance - less reflectivity, higher contrast, better color reproduction. Moving on to battery performance, the Galaxy S5 comes with a bigger 2800mAh battery compared to its predecessor but still doesn't match the LG G2's 3000mAh unit. But to make the most out of the battery capacity, most devices rely on software too - both phones have power saving modes, which we disabled for these tests. 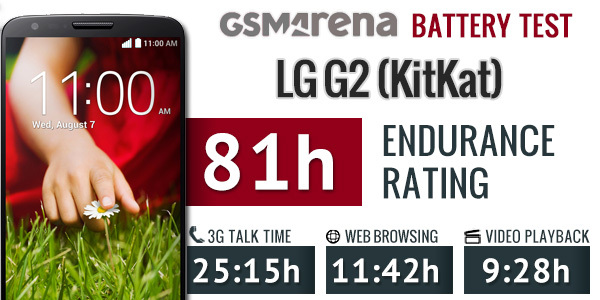 We're using numbers from our latest battery test of the LG G2, after the KitKat update, which managed to notably improve the battery performance. The only test where it failed to outdo Jelly Bean was video playback. Here go the numbers. 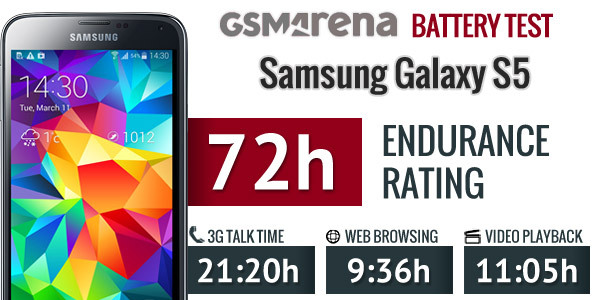 Some great scores for both sides in the calling but the LG G2 is almost 4 hours clear at the top. Things are closer in web browsing but the LG G2 is still 2 hours ahead. And finally a victory for the Galaxy S5 - it managed 11 hours of continuous video playback while the G2 did 9 and a half. Before the KitKat update, the LG G2 was let down by stand-by time for an overall rating of 62 hours - that's the time between charges if you do an hour of calling, browsing and video playback a day. With KitKat, the LG G2 managed a much better stand-by time for a great score of 81 hours, which secures it a comfortable win.